In a sharp admission, the World Bank in its new report, "India Development Update", released this month, has said it is unable to solve a crucial "puzzle". Providing a graphic picture of 10 different indicators of growth, including the Gross Domestic Product (GDP), it says, the question that puzzles is, "why" India's reforms "have not yet succeeded in reversing the slowdown in investment, exports, and certain other aspects of the economy." Insisting that if anything, "the slowdown has continued to deepen", the report shows in a comparison between three different phases 2004-08, 2004-08 and the period first quarter of financial year 2016-17 to the second quarter of 2017-18. 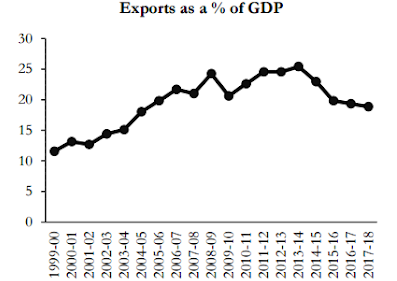 It says, whether it is GDP, consumption, investment, exports, imports, agriculture, manufacturing, construction, services, or bank credit, India achieved the highest growth in 2004-08, which slowed down to in 2004-08 , and experienced a further slowdown in in the last phase. Hoping that Indian economic growth would "resume gradual acceleration and converge to potential growth rate in coming years", the report, however, underlines, "The GDP growth was disrupted in the last two quarters of 2016-17 and the first quarter of 2017-18 due to demonetization and adjustment to the implementation of Goods and Services Tax (GST)." Coming down heavily on the second "disruption", the report regrets, "The tax rates in the Indian GST system are among the highest in the world. The highest GST rate in India, while only applying to a subset of goods and services traded, is 28 percent, which is the second highest among a sample of 115 countries which have a GST (VAT) system and for which data is available." Suggesting that the GST rates in India are among the most complex, too, the report says, "The Indian GST system currently has 4 non-zero GST rates (5, 12, 18, and 28 percent), adding, "49 countries use a single rate, 28 use two rates, and only 5 countries including India use four rates... Italy, Luxembourg, Pakistan and Ghana." It notes, "In addition to the number of rates, the extent of exemptions and sales at a zero rate is a critical design parameter for a GST. While exemptions allow to ease the tax burden on items with a high social value, such as healthcare, they also reduce the tax base and compromise the logic of the GST..."
The impact of zero GST, the report says, has results into a situation where "an exempted good or service is an input into another taxable good or service"; it creates "incentives for vertical integration to keep the exempt status"; and raises "compliance costs by making it necessary to allocate input taxes between exempt and non-exempt output when manufactured or traded together." Finding more flaws with GST, the report says, "The introduction of GST has been accompanied by state administrations experiencing disruptions in the initial days after GST introduction. This included a lack of clarity on discontinuation of local taxes." The lack of clarity, says the report, resulted in Tamil Nadu imposing "an entertainment tax to local governments in order to impose it over and above a 28 percent GST", Gujarat's textile sector demanding for exemptions or lower tax rate; and Maharashtra increasing "motor vehicles tax to compensate for losses due to GST." It adds, "There also have been reports of an increased administrative tax compliance burden on firms and a locking-up of working capital due to slow tax refund processing. High compliance costs are also arising because the prevalence of multiple tax rates implies a need to classify inputs and outputs based on the applicable tax rate." The result has been, says the report, while "collection from GST exceeded expectations initially, but has declined more recently. In the first month of taxes filed, July 2017, revenue was initially estimated at INR 922.8 billion and has since been revised upwards to INR 940 billion. Since July, estimates of revenue collection have weakened slightly, with a dip to INR 837 billion in December 2017." Even as stressing on what the report calls on the need for completing the "unfinished structural reform agenda", the report seeks to reverse various subsidies it has been providing as one major thrust. Thus, it says, "India’s worsening macroeconomic stability after the global financial crisis can be traced to ... an expansion of the National Rural Employment Guarantee Act", expanded "from 200 to 600 districts, waiver of farm loans, increased spending on food and fertilizer subsidies", and increasing burden of salaries to "central government employees."